Hello lovelies! Ah, I cannot believe that October is coming to an end. When I see my birthday coming up, I really start feeling the cold winter, breathing down my neck..can't help it! Alas, it is one of my favorite times of the year, it's quite chilly, but not yet too rainy or gloomy, and there are wonderful autumn colors all around. With my mood still quite positive every day, I am enjoying all the goodies I got from Korea the other week. One of these is very Autumnal to me - theFaceShop Honey Black Sugar scrub, and I shall tell the tale of our love! So jump in! This is one of the highlights of my haul, unexpectedly! I've used it a couple times by now, and I gotta say I'm in love. I first heard about it on Get it Beauty (Korean beauty program), episode where they were talking about how to get youthful, radiant skin. While watching Get it Beauty the hosts talked about this particular scrub as a peeling option for dryer, more sensitive skin. I looked it up immediately, and it being rather affordable, put it in my shopping bag. No Korean scrub has ever disappointed me with their general 'scrubbing' function, so I didn't fret too much about it being a waste of money even if it didn't live up to its claims. The claims themselves are rather simple (surprisingly, usually Korean beauty products claim to be the best thing since sliced bread) - to exfoliate deeply, remove blackheads, moisturize the skin and provide a lovely glow. And boy does it deliver! Although I can't speak too much on blackheads, since I only have a few, those that I did have seem to have vanished, and so did my whiteheads and occasional pimples! One thing I noticed right off the bat when I came to Korea was that Korean women have rather lovely skin. It always has that youthful glow to it, apart from the makeup. I've always envied that since my skin, albeit not troubled at all, always had that weird dry patch, a strange pimple or just dullness to it. It has gone away for the most part long ago, but flaky skin is still an issue for me. This scrub is an absolute god-sent for that! 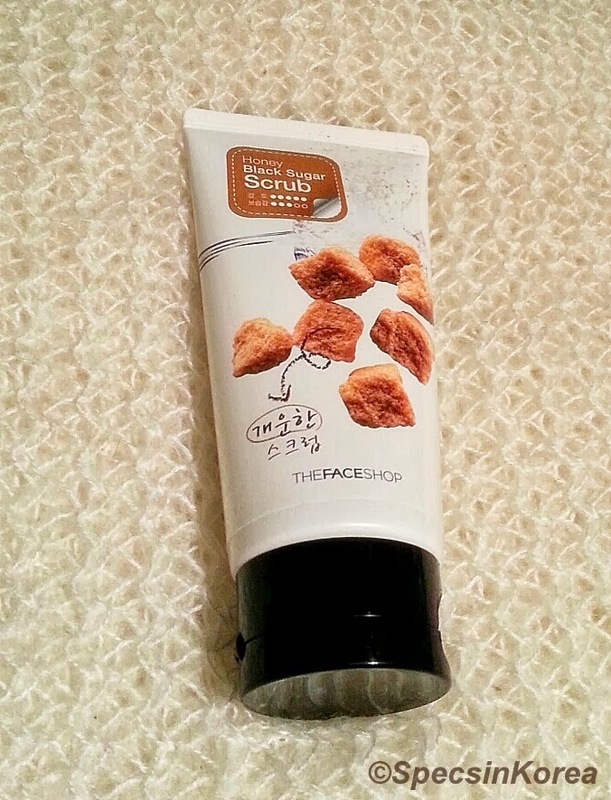 When I got my package, the first thing I tried out was, naturally, this scrub. I was stunned by the results! However, do not, by any means, expect this to be a moisturizer! In the picture you can see the texture and looks of the scrub - it's exactly what I expected. With the name of 'Honey Black Sugar' you'd expect something that looks like this, right? It's very gooey, but not runny at all, think slightly thickened honey. The black sugar pieces are very noticeable, but not rough at all. When massaging the face one can definitely feel the scrubbing, but in a good way (although due to light abrasiveness I wouldn't suggest this to people with broken capillaries and super sensitive skin). Having honey as the base, this scrub feels quite luxurious! Point to note: the packaging, as you can see, is a squeeze-tube, like any regular face wash. It is very appropriate for the texture of the product, as the hole in the lid isn't too big, you have full control over the amount to dispense. That means - no waste and no mess! The only thing is that if you get the product around the lid, do clean it off, or it'll be problematic to close. Apply this before you wash your face (remove the makeup first, I'd suggest) on dry skin and massage for about a minute, or until you feel it is no longer too 'scrubby'. Then wash off, follow with a regular cleanser if needed, and voila! The result is skin that's so supple and smooth like you wouldn't believe! And, the best part, is isn't drying. Most scrubs give me that tingly, slightly tight feeling before I get to moisturize my face, but with this, my face just feels clean and so smooth. You'll feel it warming up as you massage, I attribute this to the honey. The entire experience is very pleasant, and slightly addictive, if I may say so! Point to note: On the tube it says to first cleanse your face, dry it and then scrub it. But I suggest using it 'my' way - following up with a regular cleanser, as it will make sure there is no residue left! And the scent...oh the scent!! It smells like honey caramel (both of them actually being in the ingredients, surprise surprise)...very warm, comfortable, not too overly sweet and natural scent. Of course, if you're not a fan of honey - stay away, as it is the dominant note! I wasn't expecting the scent to be this natural. I keep it my room until I have to use it, otherwise my family could mistake it for honey ^___^. All in all, this is now an HG type of product, a must-have for those looking to cleanse, scrub and moisturize the skin. I only use it twice a week at most, but the results remain visible until the next use. And since you only need a small amount to cover the entire face, this tube will last a while! Where to buy: TheFaceShop website, Korean drugstores, TheFaceShop stores, Gmarket, Ebay. Hope you've enjoyed this review! Till next time, beauties! Disclaimer: the product in this review was purchased by me for personal use.